Polish Senate speaker Stanislaw Karczewski said that the Senate will continue working out the law on decrease of pensions for the soldiers, who started to serve during the period of Polish People's Republic. 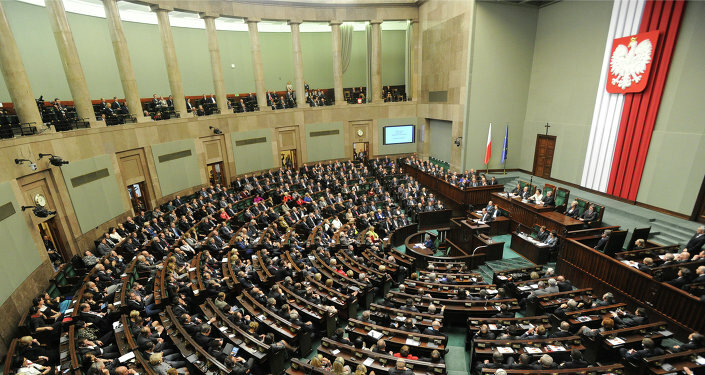 WARSAW (Sputnik) — The Polish Senate, the parliament’s upper house, will continue its work on the laws recently adopted by the Sejm, the lower house, which have been criticized by the country's opposition, Polish Senate speaker Stanislaw Karczewski said Tuesday. Polish opposition has been boycotting the work of the lower house since Friday after it announced its plans to restrict the work of journalists in the Sejm. Despite the boycott the lower house on Monday had enough members to meet the constitutional quorum and approved a number of bills, including the draft budget for 2017. The opposition considers the results of the vote illegitimate, demands to hold a second session and calls for resignation of the Sejm’s speaker, Marek Kuchcinski. "The Senate will continue working out the law [on decrease of pensions for the soldiers, who started to serve during the period of Polish People's Republic]… The process of law adoption on Friday was appropriate and was in line with the charter," Karczewski said, as quoted by the Polskie Radio broadcaster. He added that the Senate would continue working on the law on Tuesday, and the country's budget would be discussed in January, 2017. At the same time, representatives of the opposition Civic Platform party claim that the Senate can not work on "the documents that could not be classified as laws."